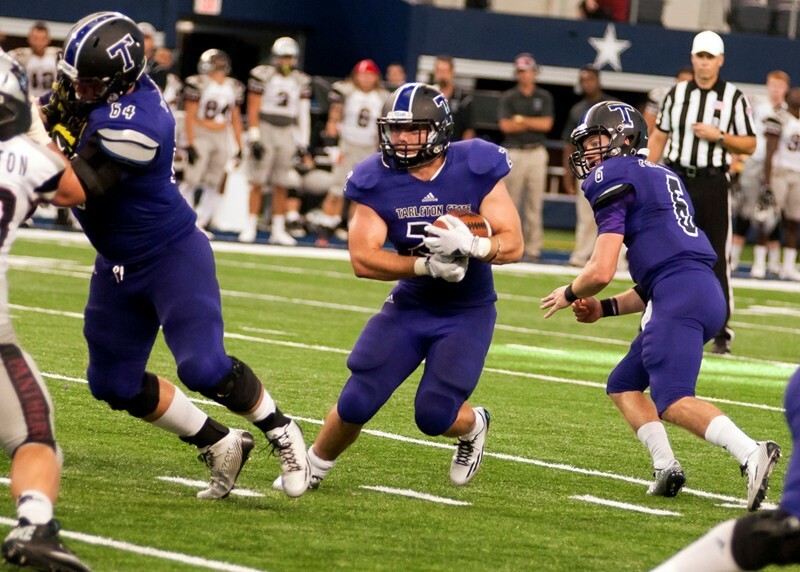 WICHITA FALLS – In a reversal of this season’s earlier matchup in Stephenville, Tarleton State exacted its revenge over rival Midwestern State with a last-minute touchdown – this time to claim a third-place finish in the LSC Playoffs. Tarleton scored on its first possession after the defense forced a fumble on MSU’s opening drive. The Texans took over at the Midwestern 32-yard line and drove the rest of the way, finding pay dirt on a two-yard run from Zach Henshaw. After the Tarleton defense held on fourth down to keep the Mustangs scoreless in the first quarter, the scoring picked up beginning just 16 seconds into the new frame when Jeremy Louis picked up Tarleton’s second loose ball of the day and ran it home for a 14-0 Tarleton lead. On the next Tarleton possession, Jabari Anderson ran one in from seven yards for a commanding 21-0 Tarleton lead. Midwestern would strike right before halftime, however, to cut the Texan lead to just 21-7 entering the break. Out of the half, Midwestern State answered with 15 unanswered points on a pair of one-yard runs – and a two-point conversion to take a 22-21 lead with 4:04 left in the third quarter. Tarleton would answer right back, however, with a 48-yard field goal from Blake Barnes in the final minute of the third quarter to lead 24-22 entering the fourth quarter. The high-scoring final quarter saw the lead change right back, however, as Midwestern punched it in from one yard out to cap off a six-play 75-yard drive. It didn’t take long for Tarleton to answer right back as Zed Woerner connected with Bubba Tandy for a 50-yard touchdown strike to retake the lead 31-30. The seesaw battle continued as MSU answered with a 2-yard touchdown run before Tarleton answered back with Anderson’s second touchdown run of the day. Midwestern State took its final lead of the day at 41-37 with a 38-yard field goal with just over six minutes left in the game. After Tarleton turned it over on downs, the Texan defense stepped up the challenge to force a three-and-out and give the offense one final chance with 1:20 left in the game. Woerner led the Texan offense down the field, covering 88 yards in six plays and finishing the game the way it started – with a two-yard run by Henshaw. The defense stopped Midwestern on its final three plays to secure the win and third place in the conference playoffs. Tarleton finished the game with 147 yards rushing on 50 carries, led by 81 yards and a pair of scores from Henshaw on 23 carries. Anderson also finished with two scores and 70 yards on 20 carries. Woerner threw for his third straight 300-yard game with 316 yards passing on 20-33 attempts with a touchdown. Tandy, who caught the only receiving touchdown of the day, ended with 172 yards on six catches. Defensively, Robert Adkinson and Alex Anderson led the way with nine tackles each while Marc Martinez and Damien Ward each had a sack. Anderson and Jared Thames forced fumbles while Martinez, Ward and Louis each picked up a loose football. Tarleton State finishes the regular season and LSC playoffs with a record of 5-5. The Texans will await an invitation to any potential bowl games.